When driving north on California’s Hwy 101 over the Golden Gate bridge with the city of San Francisco in the background, the scenery quickly changes from asphalt, trolleys and steep city streets to the sparsely developed green hills of Marin. Few 5-lane highways can feel like a winding road like Hwy 101 as it meanders around bends over hills with the Sonoma Mountains off in the distance. Like a bookend at the finish line of a road rally, the city of Healdsburg sits at the "end" of 101 an hour north and serves as the last sign of civilization before the road disappears into the Northern California landscape. Healdsburg is the perfect starting (or ending) place for wine country day trips in any direction. The city also anchors the far east end of Dry Creek valley like the a splash down pool at the end of a water slide. The valley (and creek) feed right into the town square. On a recent sunny fall day Mrs. B and I went for a drive in Dry Creek valley with no particular destination or plan in mind. We just wanted to be spontaneous and see what we could discover. We started in Healdsburg at the Flying Goat Coffee on the square, then set out east on Dry Creek Road. Harvest was just wrapping up. The last of the grapes were coming in from the vineyards, winemakers were tired from the harvest but happy to take some time to share stories about the stellar 2012 fruit that had been coming in. Our first stop was at Talty on Dry Creek Road where Mike Talty has been making small batches of premium estate grown Zinfandel since the family purchased the land in 1997. Mike Talty is serious about his Zinfandel. He makes no apologies for doing what he thinks is best for his vines on his land, no matter what his neighbors tell him he should do. The results speak for themselves. Much like Australia's Next Chapter of Syrah, Zinfandel too can suffer from a perception of being too high in alcohol and too oaky. But also like Australia's young generation of winemakers, Talty makes a decidedly more accurate representation of what Zinfandel can be. Instead of scorching aromas of burning alcohol and port, Talty's Zins show off fresh ripe red fruits, namely cranberry, pomegranate and black cherry with oak in a supporting role in the background. Talty was especially happy with the 2012 fruit sitting in open top fermentation vats. He walked us through his winemaking techniques highlighting the work he does in the vineyard before grapes are even picked. The word that popped into my mind when he was describing his wines was, "work ethic". Mike Talty does almost everything at his winery—it's literally a one-man operation. But his obsession is our reward. Sadly there's just not enough of the wine to go around for everybody. Our next stop was at another premium producer, A. Rafanelli where four generations of the Rafanelli family have farmed the land perfecting their style of Zin. Winemaker, Shelly Rafanelli was equally as excited about the 2012 fruit coming into the winery. Her Great-Grandfather, Alberto Rafanelli first founded A. Rafanelli in the early 1900's where he started growing his own grapes and making his own wine. It wasn't until the 1950's that the family moved to Dry Creek Valley where his son, Americo started getting into the family business. Americo's son David along with David's wife, Patty now operate the business where their daughter, Cal Poly San Luis Obispo graduate Rashell (Shelly) now leads the winemaking team. Stepping into the winery felt somewhat like stepping into a museum. Old redwood siding, 1970's style light fixtures and old wine vats felt like we were in someone's home that just happened to be a winery. There were no fancy tasting room with tasting flights, however, Shelly did take us into the wine cave where we had a chance to sit at the table and see A. Rafanelli wine firsthand over some good conversation. It's not very often when a Zinfandel can take you back in time, but I imagine early Zin producers in the valley used to make this style of wine back when wine didn't rely on wine critics scores or press. The 2010 Zinfandel showed well focused fruit from old vines with dark candy apple colors in the glass fading out to a lighter maraschino cherry red around the rim. Shimmering highlights of star bright ruby stone color suggested a clean, precise winemaking style. Alberto would surely be pleased to see how well the Rafanelli's have upheld the highest standard of Zinfandel. Fresh, ripe bramble berry, cranberry and summer raspberries were complimented in the glass with rhubarb pie, faint savory and fresh ground spices. You can tell a good wine by its finish, and in this case the lingering finish seemed to go on and on much longer than one would expect from Zinfandel. 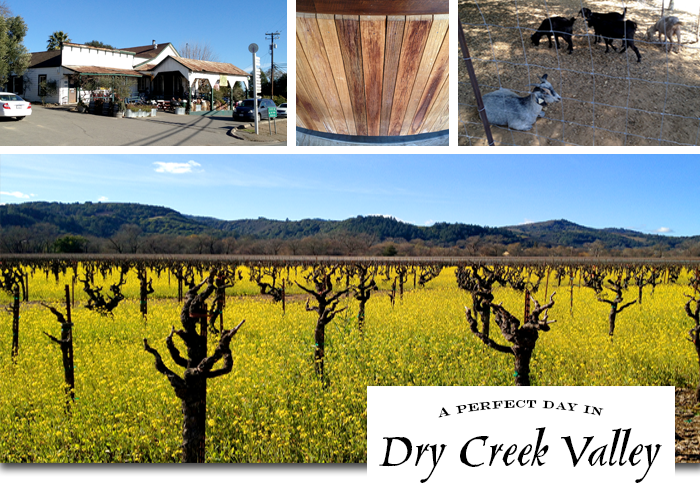 Dry Creek Valley isn't just about Zinfandel. Sauvignon Blanc and Cabernet Sauvignon do very well here, especially when grown on hillsides around the valley rather than on the valley floor where Zinfandel lives. We had a chance to taste a few Cabernets at Kachina Winery where Greg Chambers and his wife Nancy established a green "off-the-grid" winery in the early 1990's after leaving their high tech jobs in silicon valley. Harvest lunch was underway featuring local coffee-rubbed Berkshire pork tenderloin and Farro with wild mushrooms and dried cherries. One of the standout wines was the 2007 Kachina Dry Creek Valley Cabernet Sauvignon featuring Darth Vader dark colors and dark red fruits in the glass. At a sneaky low 13.9% alcohol the wine seemed bigger and more complex, which is an accomplishment in and of itself. And at $42 the price/quality ratio was above average—it seemed like the wine should cost more. Kudos for keeping the price down and quality up. A trip to Dry Creek wouldn’t be complete without a visit to another longtime family operation, Pedroncelli (pronounced: pedren-chelly) who produce a wide swath of wallet-friendly estate wines. The Mother Clone Zinfandel is especially tasty at $16 a bottle. Like the Rafanelli's, the Pedroncelli family has many vintages in Dry Creek Valley under their belt since John Pedroncelli Sr. purchased the winery land in 1927. Wine lovers have gotta love it when a winery works as hard as the Pedroncelli's do to keep their prices down to make the wines available for enjoying every night of the week. Upon walking into the tasting room, Mrs. B and I were pleasantly surprised to find most of the estate-grown wines were around $12-$16 a bottle. The Pedroncelli's source fruit from three locations in Dry Creek valley added up to about 180 acres total. Solid, well-made wines fit into the family tradition of bringing everyone together at the table over a meal, a bottle of wine and good conversation. We found the Petite Sirah and unoaked Chardonnay to be easy drinking and a good value (which is why we loaded up on some). If you ever visit the winery, ask for Gina in the tasting room. Ridge Lytton Springs was the final stop. If I had to pick five of my top five favorite domestic brands, Ridge would certainly be on the list. 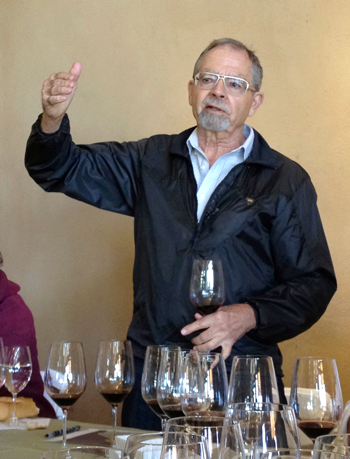 Few California wineries have had the same winemaker since the 1960’s, but Ridge hit the jackpot in 1969 when they brought on Stanford Philosophy major, Paul Draper who had just returned from setting up a winery in Chile. Inspired by Napa Valley’s Claret’s of the 1930’s, Draper set out from the beginning to produce timeless ageworthy wines that represent the place they were grown with a hands-off approach. Ridge's unique history goes back even further to the 1880's when a prominent Italian San Francisco doctor planted the first vines in rare limestone soils high above San Jose in the Santa Cruz mountains. That vineyard would gradually attract more plantings from different owners over the years and become the Monte Bello vineyard from which one of the finest domestic Cabernet Sauvignon's comes from. It seems the founding partners of Ridge had a knack for establishing both their locations at Monte Bello and off Lytton Springs road way before anyone else saw the potential. Over the past four decades the stars have aligned for Ridge and they continue to produce exceptional wines year after year. An afternoon of Zinfandel has a way of making you crave pizza and home made sausages. Luckily Chef Dino Bugica is there to scratch that itch with Diavola, located a few exits up 101 in Geyserville. Bugica is well known for his Braised Beef Tripe alla Fiorentina, wood fired pizzas, home made sausages and pork butchering workshops. It has almost become a tradition at this point—when we get done visiting wineries, we always seem to find ourselves at Diavola. 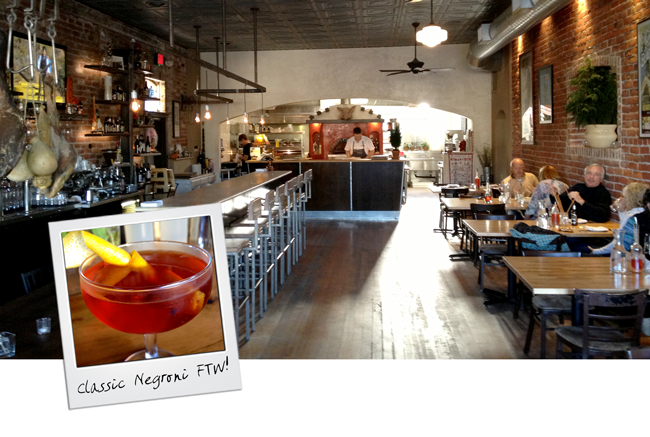 On this day we ready to put down the landing gear and call it a day with a classic Negroni (my drink of choice) and a wood fired pizza or two. 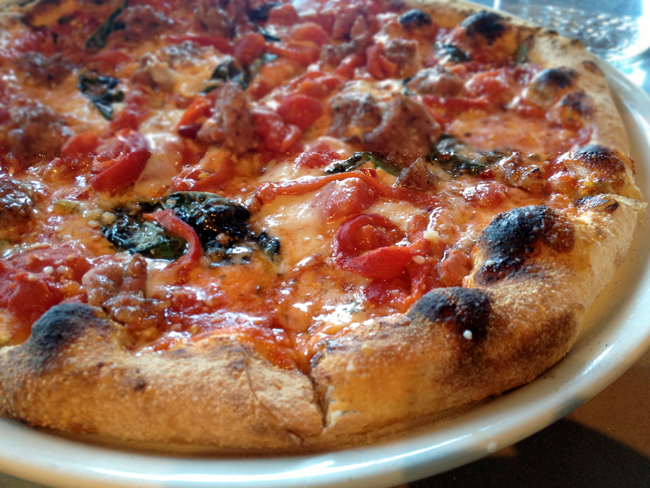 Mrs. B picked the Inferno featuring roasted red peppers, tomato, basil, mozzarella and spicy italian peppers. We took it a step further and added homemade sausage. I opted for the aptly named Diavola pizza with roasted red peppers, provolone cheese, house made meatballs, pine nuts, raisins and arugula on top. That little bit of fresh green bitterness from the arugula brings all the flavors together nicely. For Mrs. B and I, days like this are why we live in Northern California. The history of food and drink in this part of the world has attracted visitors and transplants for over a century. We took our car loaded with spoils of the day along with our full tummies and headed home. No matter what time of year, each day presents the opportunity to have a perfect day in wine country.